This page publicises an assortment of information from across the world related to Tristan da Cunha during 2115. 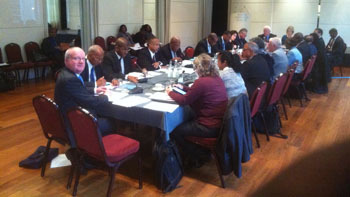 The overseas territories' Joint Ministerial Council is a major landmark in the annual calendar for the UK Representative. Work started months earlier as I'm one of the 'sherpas' (those who plan the path to the summit) with regular advance meetings to thrash-out the agenda and start to develop positions that can be formally agreed in London. This year I was also Tristan's entire delegation, as the sheer logistical challenge meant the Chief Islander couldn't make the trip. That made for a heady mix during the week - dashing between meetings with ministers, helping draft the final communiqué and dining with the OT premiers, attending plenary sessions and pulling half-pints of Island Ale for guests at the closing reception. Among the most substantial items discussed was the way the UK government wants to deliver its 'blue belt' ambition for the overseas territories. Tristan is rightly proud of the independently-certified sustainability of its fishery, but we also insist that marine protection measures must be science-based, properly resourced and locally supported. I delivered that message to the OTs minister and to two committees of MPs. The key is economic development, and for us that's very much about 'connectivity' - the shipping links, the harbour, and the internet. Here again, the meetings with MPs, ministers and officials provided the chance to raise awareness of Tristan's challenges and opportunities. This year Tristan was also invited to make the leading OT speech on education and skills. I outlined the major developments at St Mary's School, with subject specialists arriving to boost our iGCSE ambitions. And I told the story of Nathan Swain's world-beating essay that reflected so much credit on the school and said so much about how the skills of Tristanians will build the community's future. It was very gratifying to hear later that the UK skills minister was enthusing to colleagues about a certain small island that had just captured his imagination. It's been a frantic, tiring few days, but this is Tristan's key annual chance to make an impact in the corridors of power. I think we did. Photos show the Tristan Lobster tarts, with above right, an appreciative OT Minister James Duddridge, and below Chris Carnegy with brewmaster Martin Brunnschweiler from the Bushy's Ale of Man Brewery which produces the Tristan Island Brew: see Tristan Island Brew for more. The final moment of the week's events brought Tristan's signature product to centre stage. 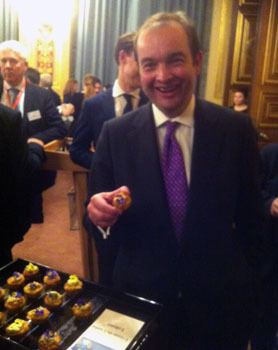 A reception in the Foreign Office saw Overseas Territories minister James Duddridge give the valedictory speech. He mentioned that Tristan Island Ale beer, infused with Tristan berries, and canapés made with Tristan lobster, were both being enjoyed - and regretted that he'd missed his chance to taste the lobster at last year's event. As the speeches closed, the last words of the 2015 JMC were a cry from the minister 'Bring me the lobster!'. The staff duly obliged. Cllr. Jacqui Ellick (Ascension), Cllr. 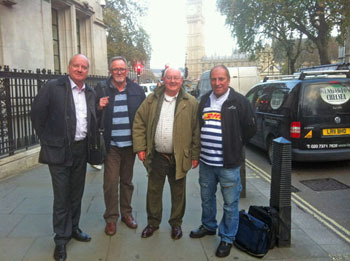 Lawson Henry and Kedell Warboys (St Helena), Chris Carnegy and Cllr. 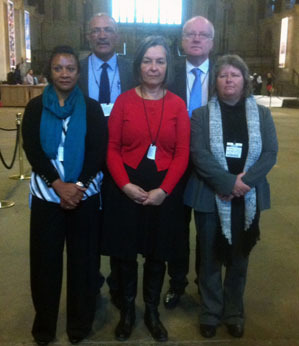 Caroline Yon (Ascension), in Westminster Hall before meetings with Foreign Affairs and Environment committees. The fourth meeting of the Overseas Territories Joint Ministerial Council (JMC) will be held in London on 1 - 2 December at Lancaster House and will be hosted by FCO Minister for the Overseas Territories James Duddridge MP. in session on 30th November with Chris at the top of the table, left, looking at the camera. which, however, had nothing to do with the island. 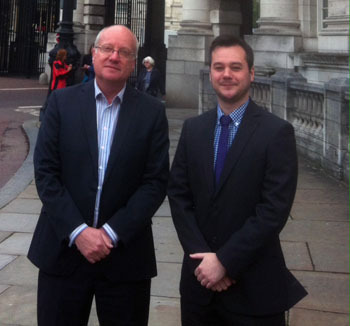 The photo shows Tristan Government UK Representative Chris Carnegy (left) with Jonathan Brown outside the FCO in Whitehall on 27th August when they met to discuss Tristan business. 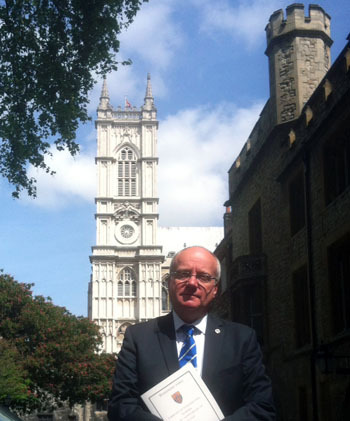 The island's UK Representative Chris Carnegy was in Westminster Abbey on May 10th for a service of thanksgiving, in the presence of the Queen, the Duke of Edinburgh and other senior members of the Royal Family. Chris says 'the World War Two veterans were the stars of the show, reminding us all of the dedication and sacrifice of that heroic generation. And in the Abbey I thought of HMS Atlantic Isle and the profound changes the war heralded on Tristan. Like every part of what was then the Empire, Tristan did its duty. It's been an extraordinary privilege to represent Tristan on such a special day'. 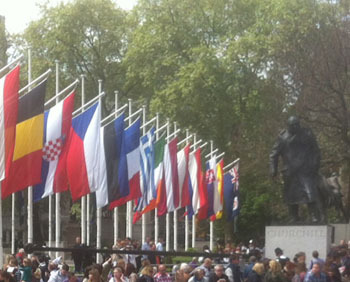 Left: Churchill looms over the crowds in Parliament Square. Tristan's flag was among those flown for the VE Day events. 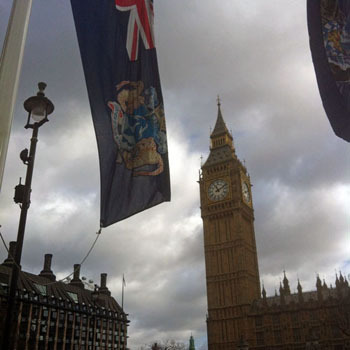 Tristan's UK Representative Chris Carnegy attended a London gathering of the top civil servants from across the Overseas Territories. The Heads of Public Service meeting explored how OTs can best run government affairs, despite the challenges of isolation and limited resources. Finance, accountability, safeguarding and skills sharing were all on the agenda. 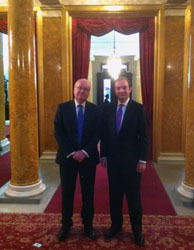 FCO photo right shows Chris fourth from the left alongside James Duddridge, Minister for the OTs, sixth from the left. 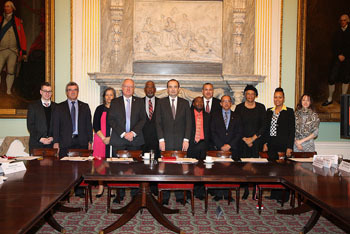 The two-day meeting, held at the Foreign and Commonwealth Office on March 23rd and 24th, received a visit from James Duddridge, minister for the Overseas Territories (OTs) in the Westminster Government. 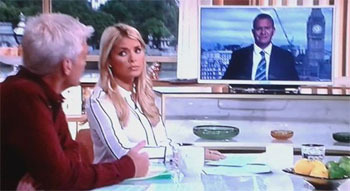 Chris was able to question him about UK support for OTs. Chris was representing Administrator Alex Mitham who couldn't attend because of the distances involved; he'll report back to Alex on what he learned from the sessions. Back in London, Tristan was part of a very special occasion to mark the day in Westminster Abbey. 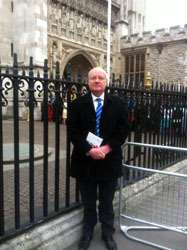 The island's UK representative Chris Carnegy attended the Observance for Commonwealth Day, in the presence of The Queen, the Duke of Edinburgh, Prince Charles and Camilla, and Prince William and Kate. Chris said "Tristan had a privileged position at the very centre of events in the Abbey. It's wonderful to feel our island is recognised in this way at such significant occasions". 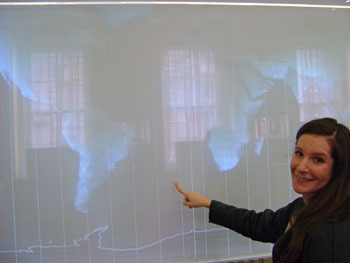 We also feature here photos of Laura Benyohai who is the FCO Tristan da Cunha Desk Officer. 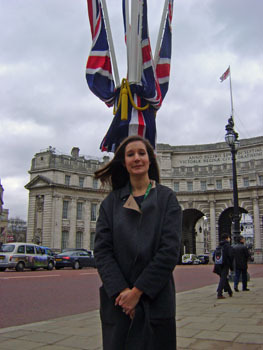 Chris carnegy has prepared an article for the August Newsletter on Laura's work and we publish here images of Laura during a meeting with Chris on 4th March, also showing Tristan's presence in London. 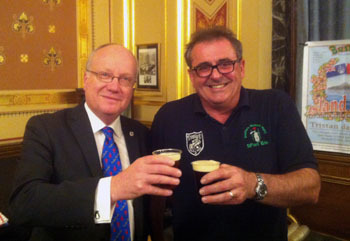 Chris Bates MBE retired from his post. At the AGM of the UK Overseas Territories Association (UKOTA), held on Thursday 12th February in London, Chris Carnegy, Tristan da Cunha UK Representative was elected as the Honorary Treasure. He joins the executive team led by Chair Sukey Cameron MBE, representing the Falkland Islands Government and and alongside Honorary Secretary Kedell Worboys MBE representing St. Helena. The UKOTA was formed in 1994, on the initiative of the Falklands and Gibraltar Governments, with strong support from the Government of the Cayman Islands. 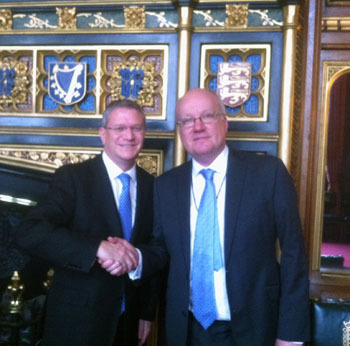 The Association exists to promote the interests of the UK Overseas Territories and co-operation between them. 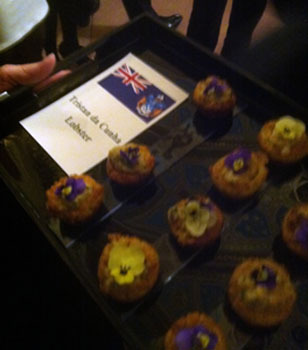 It aims to promote partnership both between the territories, and between individual territories and the UK. The Territories represented on UKOTA are: Ascension Island, Anguilla, Bermuda, British Virgin Islands, Cayman Islands, Falkland Islands, Gibraltar, Montserrat, Pitcairn, St. Helena, Tristan da Cunha and Turks and Caicos Islands. In their work, UKOTA were able to attract focus from HMG on the OTs and that led to the first White Paper on the Overseas Territories in 2002 and they were very much involved in the White paper of 2012. The Association works closely with the Foreign Office in the preparations for the annual Joint Ministerial Council (JMC) and with the Political Leaders of the Territories, organises the pre-JMC meetings and the annual Political Council meeting.